Every once in a while, a unique or particularly severe insured loss event or series of events forces (re)insurers to re-evaluate the assumptions they make about the risks they take onto their balance sheets. This is usually either because something occurs that no one ever considered possible or probable (and, thus, didn’t model), or because new learnings about a known hazard come to light. Such reassessments occurred after the terrorist attack of 9/11 and Hurricane Andrew. In the case of the former, no one ever considered the possibility that multiple fully loaded airliners could be commandeered and used as fuel-laden missiles against key landmarks. Insured losses from the attack totalled US$25.5 billion (2016 dollars, Swiss Re). Prior to Hurricane Andrew, the previous worst-case insured loss estimate of a major U.S. landfalling hurricane was US$8 billion. Andrew came in at US$15.5 billion (1992 dollars) – almost twice the worst-case – and the storm didn’t even hit Miami square on. Insurers and reinsurers were forced to ask themselves many questions, not the least of which was what if Andrew did hit Miami? September 11th prompted an almost immediate reckoning by insurers and reinsurers of their exposures to terrorism and a re-underwriting of all property and liability policies with inclusion of new wordings that excluded terrorism right across the board. 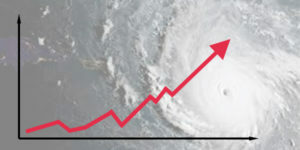 Andrew forced a major re-evaluation of hurricane risk along the coastal U.S. and drove many changes in the insurance and reinsurance sectors, including the rise of the Bermuda property market and of an insurer of last resort in Florida, and the birth of Alternative Risk Transfer instruments. I discuss the fallout from Andrew in my last Insblogs. The North Atlantic hurricane seasons of 2004 and 2005 also lead to a substantial re-evaluation of U.S. hurricane risk. In 2004, four major hurricanes (Charley, Frances, Ivan and Jeanne) tore through the Caribbean, causing massive damage before eventually hitting Florida. Total insured damage from the events came in at US$37.7 billion (2016 dollars, Swiss Re). It was the first time that four hurricanes impacted a particular state in a single season since a quartet of storms battered Texas in 1886, causing a major rethink of the potential losses that could be associated with a series of U.S. landfalling hurricanes. Many thought the insured loss record struck in 2004 would remain for a while, but it was blown out of the water the very next year with hurricanes Katrina, Rita and Wilma (aka KRW). That trio triggered insured losses of US$109.4 billion (2016 dollars, Swiss Re). Fallout from the 2004 Atlantic hurricane season included legislated changes to the way that Floridians pay hurricane deductibles for multiple storms experienced in a single season. Essentially, after the 2004 hurricane season, hurricane deductibles were made aggregate; while insureds had to pay a full hurricane deductible for a first event, they only had to pay a standard non-hurricane deductible for subsequent events in the same season. This came into effect in 2005. Legislation was also passed that required Florida insurers to pay their full Florida Hurricane Catastrophe Fund (FHCF) retention on their two largest covered events. After that, the FHCF retention dropped to one-third of the full retention for additional events. The industry aggregate retention was also ‘reset’ to US$4.5 billion. Other legislation required the Florida Office of Insurance Regulation and Consumer Advocate to be provided full access to the assumptions and factors used in “developing the actuarial methods, principles, standards, models, or output ranges” before they could be used in a rate filing. Other model changes include updates of vulnerability curves, largely due to the inputting of claims data from 2004 (and some 2005) hurricane losses. Additionally, a new class of structure and new occupancy class were added into the RMS model and square footage and year of construction was introduced as a new primary characteristic for personal lines risks. For some models, vulnerability for certain construction types was also increased. Other changes include modifications in the way that storm surge was considered in the models and at least one model vendor introduced the concept of Loss Amplification in their 2006 model. Additionally, as reported by Guy Carpenter, insurance and reinsurance companies began to make their own internal adjustments to modeled output after 2005. Additional changes to the insurance and reinsurance industries that came directly out of the 2004 and 2005 hurricane seasons, as outlined by Guy Carpenter, include changes in wordings and exclusions, particularly surrounding flood and storm surge. Higher premiums, deductibles and sub-limits were also implemented, and overall cat capacity was slashed. Several other industry changes, including rating agency practice, came about directly due to the 2004 and 2005 hurricane seasons, many of them well laid out in a pair of Guy Carpenter reports. It is difficult to imagine that 2017 losses experienced so far (the year isn’t over) will have no short- to mid-term impact other than claims cost on the insurance and reinsurance sectors. And while it takes time for models to be changed, for example, price increases and tightening of contract wordings can be managed in much tighter time frames depending on the resolve of those involved. The three major hurricanes (Harvey, Irma and Maria, now collectively know as HIM), earthquakes in Mexico and the California wildfires have to drive a least some hardening of rates and tightening of terms. The questions are when and how much. One reinsurer has already announced an increase in available capacity, anticipating at least some hardening of rates and terms at 01/01/18 treaty renewals (the irony is that if enough companies make such announcements, there will be no hardening). Several primary insurers and reinsurers are reporting higher share prices due to an anticipated increase in rates. At writing, S&P’s released an analysis of 01/01/18 treaty renewals in which it has altered its previous view on rate changes, from projected 0 to 5% price decreases at renewal to 0 to 5% increases. Anticipating second-half catastrophe losses of US$100 billion (first half losses came in at US$20 billion), S&P’s is calling HIM and the Mexican earthquakes a capital event – not just an earnings event – for the reinsurance sector. There is some speculation that hardening may come from the top down (i.e. starting with the retro reinsurance market). Additionally, there is some talk that 2017 cat losses may spook ILS investors from reinvesting, leading to a precipitous drop in cat capacity in that segment. It remains to be seen whether one, the other, or both of these projections come to pass. Regardless, a total swing of the market pendulum doesn’t appear to be in the cards as there is an astounding amount of surplus capital floating around out there, and a lot of lip-licking by some companies looking to pick up the slack left by others who pull cat capacity in the new year. That being said, at least some effects will have to be felt from 2017 cat losses – or else nothing makes sense. But then again, not much about the latest soft reinsurance cycle has made sense, so we’ll see.